"Whether it is rest and recuperation in gorgeous surroundings, endless sport for the active or solitary romance for lovers, the Seychelles has it all." According to Mark Twain, God copied the idea of heaven from Mauritius whilst the Seychelles were, according to many a wise man, born from the Creator's tears of emotion when gazing at his masterpiece. However over the top the descriptions may seem, words really cannot do justice to the fairytale beauty of the Indian Ocean Islands. Every cliché imaginable is not only fulfilled but exceeded by these bite sized pieces of perfection. The sea really is azure. The beaches really are silky soft and bleached white. The palm trees do look as if they have been drawn by graphic designers so perfectly outlined against deep blue skies and the tropical flowers are brighter and more fragrant than even the purplest of prose could describe. 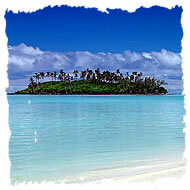 But the wonderful thing about the Seychelles, the Maldives and Mauritius is that they are more than just a pretty face. For those who find the prospect of lazing in paradise too simple a pleasure, there are stunning snorkelling opportunities, world class reef and wall diving, game fishing to excite the most world weary fishermen and limitless other watersports. On land, increasingly sophisticated spas, even on the tiniest Crusoe-esque islands, offer a few hours of the kind of serenity that only truly professional and dedicated pampering can achieve. Nonetheless, when pondering which idyllic destination to choose, it is worth considering the character and identities of the various islands. The Seychelles have been voted one of the most tranquil place to travel in the world; the Galapagos of the Indian Ocean, they are split into either granite or coral islands, both intensely beautiful and particularly appealing to nature lovers and divers. They are one of the few places on earth where giant tortoises roam freely on some of the islands. The Seychelles have sophisticated, glamorous and a fascinating fusion of cultures. 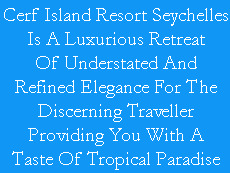 A spectacular array of stunning hotels gives Seychelles the edge if one is looking for the high life. The die hard romantics who want nothing more than paradise and the company of a loved one will be bowled over by the Seychelles. Divers too will be in heaven here. That the luxury hotels really are fabulous comes as no surprise. And whether one chooses a resort where Manolo Blahnik is de rigeur, or shoes are optional, the certainty is that the Seychelles is about as good as it gets.